The Germanic tribes seem to have originated in a homeland in southern Scandinavia (Sweden and Norway, with the Jutland area of northern Denmark, along with a very narrow strip of Baltic coastline). They had been settled here for over two thousand years following the Indo-European migrations. The Germanic ethnic group began as a division of the western edge of late proto-Indo-European dialects around 3300 BC, splitting away from a general westwards migration to head towards the southern coastline of the Baltic Sea (see feature link, right, for more detail). By the time the Germanic tribes were becoming key players in the politics of Western Europe in the last two centuries BC, the previously dominant Celts were on the verge of being conquered and dominated by Rome. They had already been pushed out of northern and central Europe by a mass of Germanic tribes which were steadily carving out a new homeland. A large-scale incursion of the sea into Jutland around the period between 120-114 BC is known as the Cimbrian Flood. It permanently altered the shape of the coastline and drastically affected the way people live in the region. It was probably this event (which is ascribed by some scholars to 307-306 BC) which affected the Teutones (Teutons) in the centre of the peninsula and their northern neighbours, the Cimbri, enough to force them to migrate southwards in large numbers. A good deal of controversy exists as to whether particular tribes were German or Gaulish (Celtic). Both the Cimbri and Teutones appear to have borne some elements of Celtic society, although they were primarily Germanic. This trait seems to have been common with all Germanic peoples in the Cimbric Peninsula, with them straddling both definitions. Early Germanics were influenced by northern Celts for perhaps a millennium before the birth of Christ, although this assertion is somewhat contentious. The subject is discussed in greater detail in the accompanying feature and also in the Germanics page (see link, above). The Cimbri tribal name is wholly Celtic, and means 'compatriots' or 'companions' in the sense that they were people with a common background and heritage. So was the tribe itself really Celtic, or perhaps Germanic with a Celtic elite ruling it? The ruler of the Cimbri, Boiorix, had a name which meant literally 'king of the Boii'. The Boii were a tribe of Celts that occupied a wide swathe of central Europe at this time, which raises the possibility that the driving force behind this migration was the Boii themselves, which is backed up by Julius Caesar's own thoughts on the matter. Even 'Teutobod', leader of the Teutones, is partially Celtic. The second part of his name, '-bod', is a Celtic word and the first part, whilst accepted by mainstream opinion as being a Germanic word, can be argued as being Celtic with a Germanic equivalent of 'folc' or 'folk'. The Cimbri also included a Lugius amongst their sub-kings, another Celtic name. The answer to this mystery may be even more strange than a 'simple' Celto-Germanic crossover. One particular theory also explains many influences in the Celtic La Tène culture which the Cimbri seem to share. This is the so-called 'Thraco-Cimmerian Hypothesis', a rather controversial subject to say the least. It concerns an Eastern Celtic 38 group, part of the Cimmerian-Scythian people, who blasted their way into the historical record in the eighth and seventh centuries BC, and eventually settled to a large extent amongst the Thracian tribes. Some modern writers believe that a Thraco-Cimmerian migration westwards out of Thrace (following the Cimmerian settlement there) triggered cultural changes that contributed to the transformation of the Celtic Hallstatt C culture into the La Tène. Among the Celts, their original name (which is proposed by Edward Dawson as being Galat - an argument that is fully supported here) appears to survive best along the fringes of their expansion, where a group would become isolated sufficiently that they had no competitors who were using the same name, and therefore had no reason to change that name (see, for instance, Galatians, Caledonians, and Galicia). If the Cimmerian name followed this pattern then the Cimbri of Jutland may indeed be a Cimmerian/Celtic mix, retaining their old name (which, given the close Indo-European relationship between all these groups could still have an original meaning of 'compatriots' or 'companions'), but being designated by many modern scholars as a Germanic tribe with Celtic influences. Skipping back to the Cimbric/Teutones migration event of the late second century BC, it may have been this which began or was part of a population shift in southern Sweden. It was this latter migration that triggered the movement of the Goths into central Europe, where they settled between the Oder and the Vistula in what is now Poland. It was also almost certainly the Cimbri and Teutones migration that triggered a large-scale influx of Belgic tribes into Britain which was only increased by the campaigns of Julius Caesar. King of the Teutons. Also known in legend as King Teutenbuecher. King of the Cimbri (and Boii?). Also known in legend as King Boiger. Teutobod and Boiorix lead a large-scale migration of Teutones and Cimbri from their homeland in what later becomes central and northern Denmark. Along the way they pick up Celto-Germanic Helvetii peoples (in territory that later becomes Franconia), but also drop off fragments such as the Atuatuci. Their passage sparks a partial tribal movement by elements of the Boii who invade the Norican region south of the Danube, and it is either the Cimbri or the Boii who attack the Scordisci Celts in the Balkans. Could this migration involve a far larger number of Germanic tribes than has previously been suspected? Certainly the general Germanic migration towards the lands of the Celts picks up pace in the first century BC, but tribal names such as the Tubantes, the 'mound people', suggest similar origins to those of the Cimbri and Teutones. 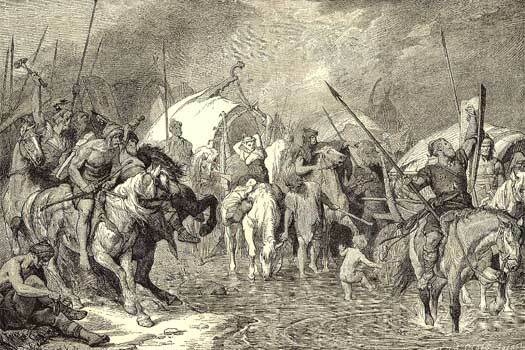 The wandering tribes enter Gaul from Germany in 109 BC, causing chaos amongst the Celtic tribes there and rendering critical the situation in the region. It is almost certainly this invasion that sparks the migration of Belgic peoples from the Netherlands and northern Gaul into south-eastern Britain, although such a migration may already have started on a smaller scale. In 107 BC, a Roman defence against the Cimbri's allies, the Helvetii, at the Battle of Burdigala ends in defeat, further exacerbating the confused situation. Remnants of the two tribes (probably a substantial number) remain in their homeland in the the Cimbric Peninsula, possibly as part of a general band of 'northern Celts' or Belgae. They are able to send ambassadors to Rome in AD 5 (as reported by Pliny), but are later absorbed by the incoming Angles and Jutes.